I thought it was a male, but now I'm not sure at all. 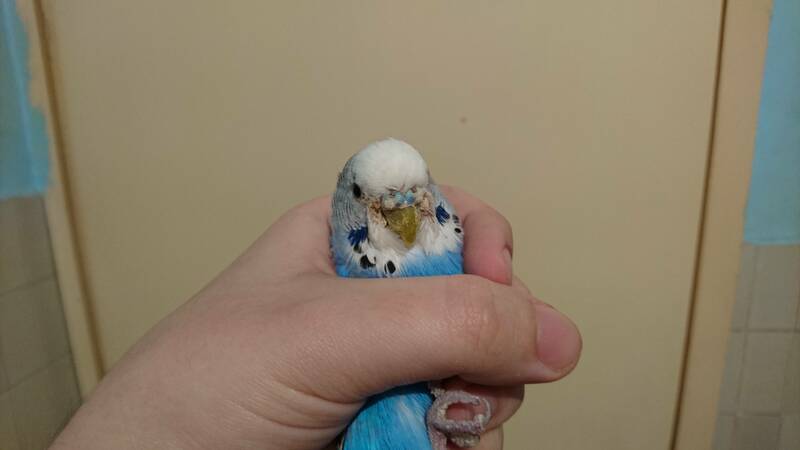 He has blue "nose", and now that blue color is fadding away, and he/she has some kind of white crust. Hi there! 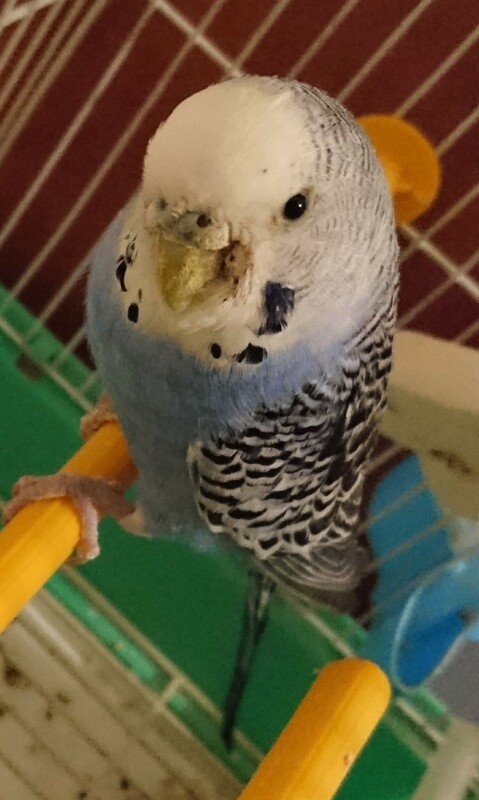 To me it looks like your budgie is a make (I think I can see a blue cere but it’s hard to tell), however I believe your budgie could have quite an advanced case of Scaly Face Mites, which is the ‘white crusty stuff’ covering the cere and beak. If I’m right, this will need multiple treatments by your avian vet but will clear up. All birds in the house will need treating and all cages, toys, perches, food bowls etc. will need washing and sterilising. I could be on the wrong track so hopefully a more experienced member will either confirm or correct for you soon. Best of luck. 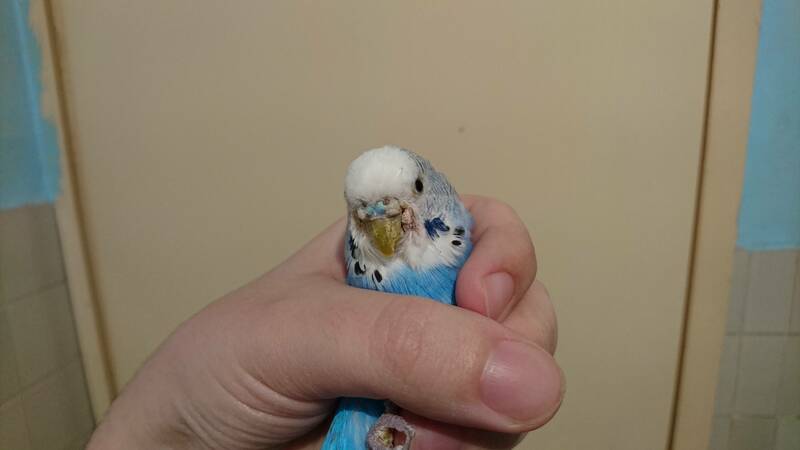 Your budgie definitely has a very advanced case of scaly mites and needs to be treated right away. The poor bird is suffering and this has obviously been going on for quite some time now. I have to ask why you didn't take the bird to the vet immediately upon realizing there was a problem? 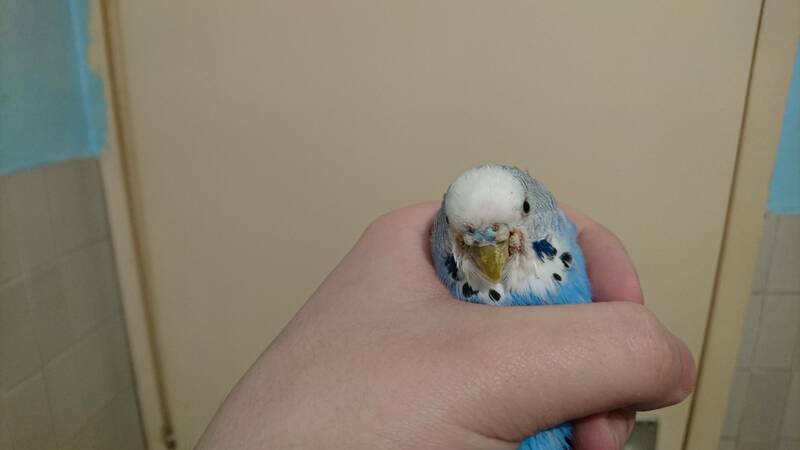 The budgie is going to need to be treated either with Ivermectin Spot-on treatment or with Scatt Spot-on treatment. Do not attempt to use any type of mite spray. Additionally, I recommend you remove any plastic perches and wooden dowel perches in the cage and replace them with natural wooden perches of varying diameters to help prevent pressure sores. Please be sure you get your poor little budgie treated for the Scaly Mites right away. I will take my bird to the vet ASAP. I didn't know what does this crust mean, and this appeared two months ago. Please make sure you ask for ivermectin spot-on treatment when you see your Avian Vet. Your budgie may need more than one treatment given the advanced stage of the scaly mites. If so, the second treatment will be given about 14 days after the first. Hopefully, two treatments will be sufficient although it may take an third treatment 14 days after the second treatment. Please be sure to update us on your budgie's condition. Thank you for your really helpful advice. I didn't know that my budgie has this serious medical condiction (parasite). I will keep you posted on his/hers recovery progress. That’s great that you’ll be taking your budgie (what’s it’s name?) to the vet ASAP to get the treatment needed. With the treatment, the condition will clear up, which is great news. FaeryBees advice about replacing all plastic and dowel perches with natural perches of different diameters is definitely worth following. It’d be terrible if your bird was to develop a foot problem. Check out the stickies for setting up a great cage as you’ll find everything you need there, from cage size to perches and toys. I look forward to hearing how your budgie goes at the vet. This bird is female. But as was pointed out above, that’s the least of the concern at this time . Ivermectin is what is needed for scaly face mites. You’ll need to thoroughly disinfect everything in the cage. Take the cage and toys, perches, etc. apart, and do every crack and crevice. Cloth or porous items that cannot be cleaned thoroughly must be thrown away (outdoor trash can). Keep us posted! I took my bird to a private vet clinic today, but they didn't know what to do. I don't have any other choice but to wait, because private vet clinics won't treat my budgie without microscopic analysis. When I got home, I cleaned cage, and everything inside with hot water and vinegar. I forgot to mention that I live in Sarajevo - Bosnia and Herzegovina, where we don't have specialized bird vet, we have only common vets that treat all kind of animals. Last edited by crnivrag; 03-22-2019 at 08:26 PM. Actually, the mites are so bad the budgie looked female; with a brown cere. The mite infestation is really quite terrible and it's only going to get worse. You don't have time to wait for a vet appointment three weeks away! You can order the medication online - just look up Ivermectin Spot-On treatment.